Alex Mann, Action Man's civilian identity, is an extreme sports athlete of Team Xtreme, taking part in the Mastervision Network's Acceleration Games, a series of unconventional televised sporting activities all over the world. Danger and adrenaline trigger hidden mental powers called AMP (Advanced Macro Probability) Factor, a result of secret experiments by his former high school coach Simon Grey. With it, Alex is able to calculate all future possibilities, choosing the best course of action. Alex "Action" Mann, Desmond "Grinder" Sinclair, Agnes "Fidget" Wilson, and Ricky Singh-Baines must stop arch-enemy Doctor X, a brilliant geneticist and bio-engineer, who'll stop at nothing to duplicate Alex's AMP Factor to rebuild Earth with the genetically enhanced neo-humanity. Dr. X captured and physically tested Alex Mann repeatedly, as well as his best friend Brandon Caine. Dr. X also added nanotech enhancements to Brandon, making him superior to Alex in battle and in athletics. The culmination of the experiments was to mind transfer Dr. X into Brandon's body to become a nanotech cyborg, able to change his appearance and infect others. Following the ninth episode the series becomes more simplified. First Appearance of: Alex Mann (Action Man), Grinder, Fidget, Ricky, Brandon Kaine, Doctor X (original body) & Nick Masters. Coach Grey also makes an appearance only as a voice. Cameo Appearance by: Coach Grey (Voice Only). First Appearance of: Coach Grey & Asazi. Cameo Appearance by: Nick Masters. First Appearance of: Tempest. Cameo Appearance by: Nick Masters. A number of crimes take place with what appears to be Alex Mann and following and second crime Agent Diana Zurvis is determined to have Alex locked behind bars. It's up to Alex and his team to try and prove that Alex is innocent. First Appearance of: Agent Diana Zurvis. Cameo Appearance by: Doctor X (original body), Branden Kaine, Coach Grey, Nick Masters. Branden Kaine begins trying to prevent Doctor X from controling him and seeks help from Alex and his team to try and stop X and his plans. This involves returning to the now sunk oil rig in a bid to access information, but all isnt as quiet as first thought. First Appearance of: Doctor X (new body). Cameo Appearance by: Coach Grey and Branden Kaine. Final Appearance of: Doctor X (original body). Cameo Appearance by: Branden Kaine, Nick Masters & Agent Diana Zurvis. Cameo Appearance by: Nick Masters, Coach Grey & Asazi (regular from here). Cameo Appearance by: Nick Masters, Tempest (regular from here), Coach Grey. Cameo Appearance by: Coach Grey & Agent Diana Zurvis. Cameo Appearance by: Agent Diana Zurvis, Nick Masters & Coach Grey. Final Appearance of: Coach Grey, Branden Kaine & Agent Diana Zurvis. Dr. X founded the Council of Doom with his evil cohorts: Asazi, Tempest, Gangrene, and Quake. Dr. X's nanotech trilobites appeared to gain collective intelligence and rebel against him; but this was actually Brandon Caine's uploaded mind punishing Dr. X. First Appearance of: Gangrene. Cameo Appearance by: Nick Masters. Cameo Appearance by: Nick Masters. First Appearance of: Quake. Cameo Appearance by: Nick Masters. Note: Grinder, Fidget & Ricky dont make an appearance in this episode. Final Appearance of: Nick Masters. Final Appearance of: Alex Mann (Action Man), Grinder, Fidget, Ricky, Doctor X, Gangrene, Asazi, Tempest & Quake. In 2004, Maximum Entertainment released the 2000 series on Region 2 DVD in the UK. 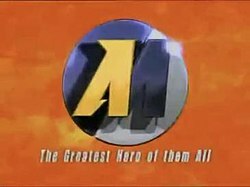 Several volumes of the show were released on VHS with three episodes on each tape. In 2001, the show won a Golden Camera Award at the U.S. and International Film and Video Festival for 'Best Animation' in the episode "The Swarm: Part 2". This page was last edited on 2 April 2019, at 20:23 (UTC).